A CALL TO IMPEACH Supreme Court Justice Elena Kagan has been initiated by Congressman Louie Gohmert. Standing on the steps of the Courthouse immediately following the decision affirming the constitutionality of ObamaCare on Thursday, June 28 2012, Gohmert called for an “investigation” that would lead to the removal of Kagan from the nation’s highest bench. 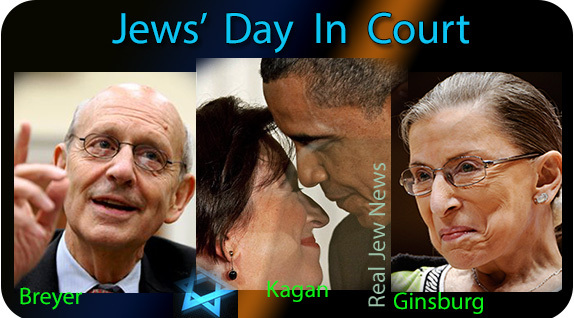 Kagan, a Jew, joined her “Yea” vote with her fellow Jews on the bench, Ruth Bader Ginsburg and Stephen Breyer—which, of course, comes as no surprise—given American Jewry’s push to further centralize their control in usurping state and local government. Gohmert contends that Kagan should have recused herself from ruling on ObamaCare due to her serving as Solicitor General when the law was passed in 2010. The case for Kagan to “recuse” herself is supported by a chain of e-mails allegedly demonstrating that Kagan’s office mounted an early and aggressive effort to prepare for legal challenges to the individual insurance mandate before its passage in March of 2010. 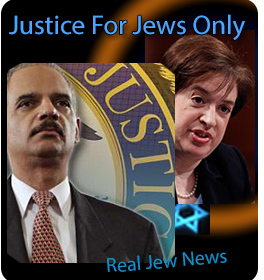 But on October 14, 2011, US District Judge Ellen Segal Huvelle, a Clinton appointee AND a Jew, ruled that the Justice Department did not need to release “personal” e-mails Solicitor General Kagan typed on her taxpayer-purchased computer to people in the White House. 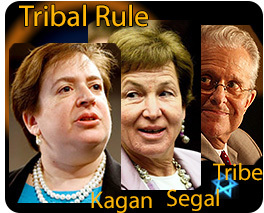 Moreover, it is a known fact that Kagan wrote an e-mail to Laurence Tribe, (YES - a member of the “tribe”) a Harvard constitutional law professor who was also working for the Obama administration at the time the law passed. In the e-mail, Kagan wrote: “I hear they have the votes, Larry! Simply amazing.” The e-mail’s subject line was, “Fingers and Toes Crossed Today!” View Kagan Documents Proving Involvement In ObamaCare Here. Regarding Kagan’s Jewish duplicity, House Judiciary Committee Chairman Lamar Smith in a letter dated July 6, 2011 asked the Obama administration to provide documents and internal correspondence on Kagan’s role in defense of the health reform law. The Justice Department rejected the request in a return letter that Assistant Attorney General Ronald Weich sent to Smith on October 27, 2011. Smith then sent his own return letter to Holder on October 28, 2011, asking that he comply with the committee’s original request for Kagan-related documents and interviews by November 4. According to the House Judiciary Committee, the November 4 deadline came and went and the DOJ did not respond to Smith’s October 28 letter. When Holder appeared before the Senate Judiciary Committee on December 8, 2011, he refused to release any documents that would have disqualified Kagan from ruling on the mandate. Holder fudged and weaseled his way out of not providing incriminating documents. “I’m not familiar with that request. I’d have to look at it,” said Holder. IT’S ALL OVER NOW and the votes have been cast. Better said, the dying of America has been cast. Cui bono? 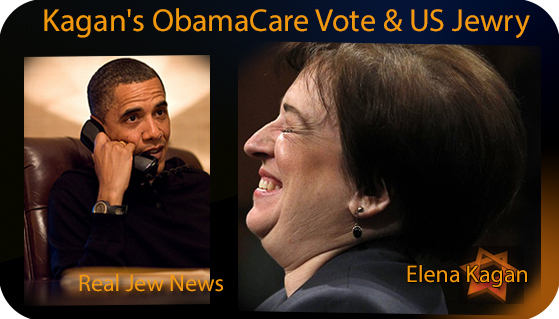 Jews, of course, who through political maneuvering got three of their own to vote for ObamaCare. And how does American Jewry benefit with ObamaCare now firmly in place? Because the BIGGER the Federal government the BIGGER control the Jews have over the hapless nation of Jewmerica. Let’s face the music, the “Havah Nagilah.” Jews RULE our Justice System as well as our Political Apparatus. It’s ALL over. ObamaCare is INTACT and there is NO WAY Jewry will allow Republicans to repeal their beloved BIG GOV law. No way in Jew Hell! HITS ARE UP but DONATIONS ARE DOWN. I lost two major contributors this month and I am down in the dumps because of it. I would like to embark on expanded projects like a Radio Simulcast to COMPETE with “won’t name the names” Alex Jones…BUT I have enough on my plate JUST TO STAY ONLINE with Articles and Videos. In other words, IT TAKES MONEY TO RUN THIS SITE. Very intriguing and it proves again the Jews are our misfortune. The unleashing of TalmudCare upon Jewmerica is going to get very ugly. Think how many broke people out there will simply not be able to buy the TalmudCare package and sure won’t be able to pay the tax which they will be slapped with. Will they be getting TalmudCare EBT cards? Perhaps this card will come in the form of an implantable chip. 1. Report to your local fusion center and prepare for your FEMA camp orientation. 2. Be implanted with this kosher microchip which will get you “healthcare” which has been approved by your Federal Rabbinical Council for Goyim Health. Will having “health insurance” be a requirement for air travel, education, and traveling upon Jemerica’s highway system? Just think of the growing TSA roadblocks as friendly healthcare inspections. All for our safety of course. You would think with jews being so self-important and self-involved and so CHOSEN, that they wouldn’t have the time to worry about what everyone else is doing. If jews are so great and so CHOSEN, why the need to control everything? Oh, I know, they’re really the most insecure, self-hating tribe around and know they’re a bunch of treasonous, murderous criminals and don’t want anyone to find out. Too late. The truth is spreading. I’d rather die than live under Jew care medical care system. A simple way to a good health care would be a not-for-profit public company which produces the most common drugs and sells them at self-cost price. And no research findings would vanish into a drawer with such a company which is owned by the people. Unfortunately for the pharmaceutical industries, their profits would tank into a bottomless abyss so this will never happen. With cancer for example you have an average turnover with each patient of something between 10,000 and 80,000 Dollars. Only for drugs, without any other costs. And if you think furthermore that there is in US alone every minute a new cancer diagnosis, everybody can imagine that no politician would dare to destroy such a multi-billion dollar market. Reproducing medicine would be perfectly legal, after 10 years expires the patent protection. But somehow dangerous on the other hand if you think at the pharmaceutical factory in Sudan which was hit by cruise missiles in 1998. The biggest producer for generic drugs by the way is in Israel. at all but this is a different story. Imagine if drugs, which cost 5 Dollar to produce, are not sold for 20,000 Dollar, instead only for 10 Dollar. Whenever I find a person like Congressman Louie Gohmert doing the Right Thing, I email them in support. I also email people who don’t have a clue as to what these Jews are doing. I would hope that everyone coming into your site and reading this also sent an email to Congressman Louie Gohmert. If only we could afford decent food to stay healthy. Putin’s hard to get a read on. He’s doing some good things but he’s a politico, and it’s very difficult to accept that Jewry would allow someone they didn’t have their hooks in to stay in power… for long. Anyway, Russia’s still a morally bankrupt nation. Even more so than the US. Look at their abortion rates as just one indicator. What the world needs is a moral re-awakening. Even Hinduism would probably bring about some salutary effects. But Jewry hates Christianity most of all – which gives proof of its legitimacy. We need a Christian renewal – now! The bigger the better. Jewry recoils from Jesus like a vampire from the break of day. Done. Also, we need to call our own elected Reps and voice support for the impeachment. It’ll never happen, but it’ll cause the Tribe some grief and while they’re focusing on that, someone else is slipping by them. Still, far too few are able to connect the dots between the fix to rule in favor of ObamaCare and the instincts/objectives of Jewry. Most of us here can see the writing on the wall: “Mene, mene, tekel upharsin.” It’s going to get very bumpy. America as we knew it is going down the drain. Christian prayer and fasting are our only hope at this late hour. Even then it’s still going be a rough ride. Up here in Canada, we have a Government-run Health Care system the MSP (Medical Services Plan). People pay annual premiums, unless their employers provide coverage as part of benefit package. One goes to the Doctor, they ask for your MSP card, and the Doctors bill the Government. There are some exceptions to what is covered, or some deductibles. Yes, there are waiting lines for specialists and certain surgeries. It does tend to work well ( we are lucky as our family MD will often take you in the same day you call ). Our Pharmacies are linked by computer so no one can scam the system; i.e. go to several MDs and build up a drug supply. However a study noted that about 95% of a person’s fiscal impact on the Health Care System is in the last 2 years of life. When the demographics shift to a higher percentage of seniors, that’s when the Health Care system, regardless of the given jurisdiction, will collapse, and the Death Panels increase. As a Canadian also, I like the Canadian healthcare system. Sometimes the waits are long but there are ways around it. Additionally, some Canadians do go to the States because some programs are not available in Canada. The US has more doctors so it makes sense. In my opinion there can be no doubt that it is the responsibility of any community to look after its weaker or helpless members. At the same time I believe that the state should run all essential public utilities on a non-profit or break-even basis to provide, for people and industry, secure and continued public services. Health care for a nation must be run on the basis of a universal contributory system, with contributions calculated as a percentage of income — including billionaires. This ensures liquidity of the health system and provides to poor workers the same medical care as to the very rich. Having performed their social duty the rich would be free to choose where they prefer to obtain their medical treatment. The problems start, in a country like the US, how to define what is a community. And as the “Elder” has pointed out what value can one ascribe to a “Health Care System,” which is provided by the Jew for the Goijm. for the benefit of an indigenous nation has any significance in a place like the US. Having said that there is only one comment left that I can think of: “May God have mercy on the people of the United States”. The Canadian system works up to a point - but only because Canada has a tiny military and can subsequently afford to divert more into healthcare. What does Canada’s military cost relative to America’s? The US is Canada’s military arm for all larger practical purposes. 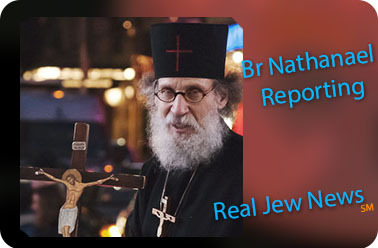 Great news on the website Brother Nathanael. Next let’s get you on the radio and then some advertisers for your radio show. So will the site be your main site or will it remain Real Jew News that is your main site? What will it take to get you on Rense.com as a radio host? Do you need some radio gear or radio software? Make a list of what you need and maybe those that really do believe in God can scrounge stuff up for you. Are you going to start accepting video advertising for products that your listeners sell? We could have viewers vote on the quality of the product. If the product is no good it won’t be allowed to be advertised on your show. That seems fair and helps the consumer. Can you make a poll of what type of products your users may buy? Would like to add that the BroVids.com site is very clean and fast. Do not change that format. All your vids are right there. You only have to categorize them. You could put short 15 second video ads after you video and generate some money that way. Let’s not forget that Justice Sotomayor has been exposed as a cryto-Jew. All 4 Jewish justices voted against the US Constitution in favor of Obamacare along with Justice Roberts whose mother’s maiden name just happens to be Podrasky. If you do a search on the Podrasky surname, you will find others who just happen to be Jewish. Quote: “But Jewry hates Christianity most of all – which gives proof of its legitimacy. We need a Christian renewal – now! The bigger the better.” (unquote). My brother … please be more precise in your choice of nouns, verbs, adjectives, and adverbs. What exactly do you mean by “Christianity”? Have we not here at RJN already demonstrated that at least one-third of the Western World’s problems can be attributed to certain expressions of “Christianity”? How many denominations/sects have been infiltrated? How many Jewish Popes have sat in the Vatican? Personally, I only respect and value the New Testament. This topic has also been discussed before here at RJN. I know the Orthodox Church has this problem pretty much under control, but do the Catholics and Protestant denominations? Surely no! In the interests of accuracy, I would want to modify your statement. What we need is a moral revival led only by those Church Denominations who recognize what the Jew menace is, and who are not afraid of setting out an agenda of active response, defense, and mass re-education to thwart it. If the Germanic and Nordic people cannot relate to such a Church, then they would become stronger and safer by simply reverting to their original belief system: Asatru. Because one cannot defeat a determined, multi-generational enemy by adhering to his/her myths and his/her gods, and worse … bowing down before them in worship. The first act for a mental slave seeking true freedom is to throw away the shackles put on him by that enemy, and learn to think free. Strength and communal safety comes from being in tune with one’s ancestors and one’s particular history. First of all, your statistics date to about 2007, it looks like. Things have been gradually improving since then. In 2010, the Russian Federation was pleased to report to the U.N.’s Convention on the Elimination of All Forms of Discrimination Against Women (CEDAW) Committee that, for the first time in decades, the Russian birth rate now exceeds their abortion rate—a change that should be acknowledged and praised. Marriages and the Russian version of Civil Unions (between a man and a woman) were also up in 2010. The Russians must be doing something right: the Red Feminists and their fellow travelers at the UN are howling. Also, abortions are down 2/3 to 3/4 since their peak about 25-30 years ago, gradually declining each year. After Putin became president in 2000, there was significant growth in spending for public healthcare and in 2006 it exceed the pre-1991 level in real terms. Also life expectancy increased from 1991-93 levels, infant mortality rate dropped from 18.1 in 1995 to 8.4 in 2008. As PM, Putin announced a large large-scale health-care reform in 2011 and pledged to allocate more than 300 billion rubles ($10 billion) in the next few years to improve health care in the country. He also said that obligatory medical insurance tax paid by companies for compulsory medical insurance will increase from current 3.1% to 5.1% starting from 2011. Particularly during Medyedev’s administration, the Orthodox Church (spearheading a pan-religious movement among other Christians, Muslims, Buddhists and Jews aimed at Russian national, social, and cultural revival) and the State have made considerable progress in the social areas, but the problems are far more extensive than what is even here in America. We are still on the way down and haven’t hit bottom yet (which leaves us no excuse), Russia is coming up after a catastrophic economic collapse in the 1990s. Present-day Russia, among other things, represents a country still struggling to establish a coherent national and international identity. On the other is the emerging New Russia, reviving a modern version of Justinian’s theory of ‘Symphonia’ between Church and State in Russian society, who seems to be like a sleeper from Tsarist Russia beginning to wake up from a hideous nightmare which began in 1917. The high rate of abortions in Russia only reflects a basket of social issues that is being addressed by many more people than just the Russian Presidency. Russia’s most capable young adults are emigrating in huge numbers, and the fact that many Russian women are marrying foreigners in huge numbers, reflects the womens’ rejection of Russian men on the one hand, and the fact that women outnumber the men on the other. Domestic problems that were either addressed under the Soviet system, or not even dealt with at all in public view, now represent challenges that the government must face if Russia is to survive at all. These social problems include, but certainly are not limited to, environmental degradation, health care, drug abuse, AIDS, organized crime, juvenile delinquency, and even basic military reform. The life expectancy of Russians, especially Russian men of working age, is decreasing. Some of this stems from unhealthy life habits, massive incidents of reckless deaths and the bad lifestyle of Russian men, particularly alcoholism and drug addiction (at least an annual $2 billion illegal drug trafficking industry), but another contributor is the decaying quality of the Russian health care system. In the initial years of the post-Soviet Russian state, organized crime was mainly focused on extracting profits from the licit economy. In recent years however, organized crime activities have begun to resemble those in other regions of the world, with the drug trade being a primary source of profits. The rise of the drug trade as a proportion of Russia’s overall organized crime problem is a consequence of the same forces observed elsewhere in the world. Due to weak state institutions, ineffective law enforcement and border controls, high levels of corruption, and not least geographical location, the states of the former Soviet Union have been disproportionately affected by the globally increasing problem of drug trafficking and consumption. With its limited border controls and large illicit migration, it is now integrated into the global drug market with links to the synthetic drug markets of Western Europe and the Far East, as well as the booming heroin trade from Central Asia. Drugs are now trafficked in all regions of Russia and their use is affecting the youthful population. Salaries of health care personnel are still low, and patients are now required to pay for some testing, clothing and medications during hospital stays. The low average income means that people must sometimes choose between paying for basic household needs and paying for hospitalization or health care. Only ten percent of Russian women who abort are ending a first pregnancy– most have one or two children and are even married. Approximately 80% of marriages ended in divorce, which throws the mother into a single family situation and she has to work. There are 10 million more women than men in the country. The aging population of Russia outnumbers its working class due to population decline. Russia’s total fertility rate prior to 1991 generally fluctuated around the replacement level and remained well above it during the 1980s. The Soviet Union’s government exercised a pro-natalist stance and offered incentives for larger family sizes, which can help to explain why populations appear to make a dramatic decrease after this government structure collapsed. The breaking up of the Soviet Union brought with it economic hardships that influenced the fertility rate of the nation by creating unfavourable conditions to bear a child. The GNP of Russia decreased by nearly one-half in 1995; when combined with the relatively high cost of birthing and caring for a child, it is clear that the declining fertility rate was a result of economic conditions. Russia’s life expectancy in 2009 for men and women was 63 years for males and 75 years for females, with an average of 68 years, well below other European countries’ averages that were as high as 77 in countries such as Germany. Ironically, life expectancy was lower under the Russian Federation than it was under a communist regime (roughly 58 for women and 64 for men). These low numbers, which must certainly reflect the long-term post-war effects among the Russian veterans of the Soviet-Afghanistan War, were attributed to a high level of mortality among working class men as a result of lifestyle choices, including alcoholism and smoking. About half of all deaths of working age men could be related to hazardous binge drinking. Such lifestyle choices are commonly associated with depression, a growing problem within Russia post Soviet times. The most frequent cause of death in Russia was heart disease, which accounted for 56.7 percent of all deaths. The HIV/AIDS epidemic is an issue plaguing Russia’s youth; people aged between 15 and 29 make up 80 percent of infected persons. The rapid spread of HIV/AIDS has been attributed to the massive amount of intravenous drug users now present within the country rather than sexual life-style. So this is what the Russian Federation is dealing with, a great deal of it related to the collapse of the Soviet Union, a disaster of epic proportions after the ten-year quagmire of Russia’s “Viet Nam” which ate up enormous share of the ailing Russian economy in military expenditures. Not only did the West with its “freedomanddemocracy” kick the chair out from under the Soviet Union in its economic warfare, but pushed it over the cliff. A late friend of mine, Bill, an 88-year old from Montana founding rancher stock, Catholic and anti-Communist to the core, a highly decorated Marine Corp veteran of WWII (Pacific theater) and Korea, needless to say a patriotic American, happened to agree with Putin when he described the collapse of the Soviet Union the as “the greatest geopolitical catastrophe” of the 20th century. Bill had also earned a PhD in Advanced Practical Engineering as well as a JD. Mostly he specialized in mining and oil extraction, although he was genius enough to re-engineer the solar system it seemed like. After his kids were grown (he raised 6 as a single father) he became an independent consultant and traveled the world on jobs. During the 80s he made 61 trips into the Soviet Union as part of his routine globetrotting rounds as an independent contractor as a consultant and troubleshooter for an engineering firm here in the US. Once he got it clear with the CIA and the KGB that he was his own man, he got along just fine. The only intel agency that annoyed him was the Mossad. Yes, he was sent as a consultant to Israhell as well, and hated it. Bill got to know Russians and their society very well, and at one point even managed to arrange a three-week trip for his assigned KGB liason and her family to the family homestead in Montana. He said that of all the people in the world he had ever meant, “the Russians are most like us.” Sometimes I think he meant “Montanan” rather than American, but nevertheless, he loved Russians. He had a good grip on the political, economic, industrial and social conditions in the USSR, the strengths and weaknesses, and heard from many friends in Russia during the 90s crises about how miserable conditions became after glasnost and perestroika. There were two significant economic crises that riveted Russia in the 1990s; the first occurred in 1992, and the second in 1998. The first coincided with the transition to a market economy following the fall of communism. The second crisis involved the crash of the banking system. Part of this transition was the removal of price controls leading to a rise in consumer prices of up to 140 percent, without a subsequent raise in living wages. The loss of controlled wages and incentives to maximize employment paved the way to lowered levels of output and productivity; this caused a decrease in productivity of the labour market that led to increased poverty and inequality. A difference in earnings was exacerbated by this effect, placing much of the population in poverty. The second economic crisis was characterized by increased violence and a sharp increase in infectious disease-related mortality. Reduced demand for labour meant increased layoffs and unemployment. Coinciding with this was a decrease in overall income amongst Russian families. The number of poor households, with 35 percent living below the official poverty line by 1995, rose shortly after the transition to democracy. The concentration of households experiencing poverty was most prevalent in ones with children and unemployed individuals. Poverty had negative implications on population growth by inducing behavioural changes within the population. The process of having a child, and subsequently nurturing and raising it, was seen as an economic burden during trying times. When there is concern regarding job security and unemployment, the likelihood of reproduction is often reduced to reflect the unwanted burden associated with children. The drop in total fertility in the Russian Federation, by almost 35 percent, solidified the positive correlation between poverty and lowered fertility. WHO in its report found that suicide rates were on the rise globally; however Russia had one of the highest suicide rates of all with 38 per 1000 people. The fall of the Soviet Union brought with it political unrest, economic turmoil, as well as increased stress on the population. With a number of people turning to narcotics and alcohol to ease the pain, others took their lives as a last ditch effort to escape. People commit suicide when they feel there is no other solution, whether it is financial or personal problems. These feelings were in existence amongst the Russian population, and they were exacerbated by the economically violent transition to a market economy. But, the past decade Russia’s health trends are all heading in the right direction: mortality is high but is is declining, fertility is low but it is increasing, life expectancy is low but rising, external mortality is high but is decreasing. Even more importantly, Russia’s health and demographic improvements have continued during the nasty 2008-09 recession and during the political unrest of the past few months. The most recent data from Rosstat show that in the January-March period of 2012 things continued to get better. Some of the most important indicators and their change from the first three months of 2011 as compared to the first three months of 2012. In 2011 the government introduced a Church-backed law banning the procedure beyond 22 weeks of pregnancy, except for dire medical necessity. The new law also made mandatory a waiting period of two to seven days before an abortion can be performed, to allow the woman to “reconsider her decision”. The restrictions include requiring abortion providers to devote 10% of advertising costs to describing the dangers of abortion to a woman’s health and make it illegal to describe abortion as a safe medical procedure. Be sure to see @ 1:07 the clip of the very active, passionate Pro-Life movement driven by the Russian Orthodox Church and their open, but respectful and non-confrontational methods of protests outside of abortion clinics. By the way, the religious currents involved in the Russian pro-life movement also include other denominational Christians, Russian Jewry, Muslims and Buddhists in the RF. This is off the Talmudcare topic dear RJN readers, but very Synagogue of Satan specific and something that has probably been on the astute minds of most RJN readers as well. Once I saw the design or logo for the London Olympics I realized the possibility of another staged event of diabolically wicked origins. I have continued to run across numerous warning signs as many of you no doubt have. If the usual suspects are implementing the “security details” as I have been reading, then be aware, very aware. Oh boy (sorry - girl), KathJuliane, what a great overview of the social situation in Russia you have given us here! I happen to know Russia and Russians personally and feel like home over there. Your article has given me a lot of knowledge which I didn’t have, but many facts jibe well with my own observations. For example, the generation of people who were children or around puberty in the 1990’s are often of visibly shorter stature than their parents, and this is not just poor working class people. Particularly in the early 1990s there was a real famine. Proteins were unobtainable. The high percentage of suicides and, particularly, the high rate of abortion was and is very unlike Africa and India where people just have children, no matter what. The reason needs not be spelled out here. I happen to be, like Wotan, a partisan of socialized health care, knowing it from personal experience in the three Scandinavian countries (Norway, Denmark and Sweden), where until recently it was decentralized where an area of a size of an average American county was responsible for the totality of health care. The family doctors and specialists are private but visits are paid for by the areas’ Funds. Hospital and all pre-and post-hospital care is paid for from taxes. In a hospital room you can meet a DEO lying side by side with a worker or an unemployed (and they, as a rule, interact well and discuss things like equals). Recently there has been a tendency for centralization with the whole health system being under the ministries of health, without any visible deterioration of care. The systems are very efficient and despite unavoidable waiting lists, all life threatening diseases are being treated very quickly. A cancer case is being diagnosed and treated like an acute disease. Corruption is zero, the price tag is less than 50% of the current American expenditures per capita and the quality (and patient satisfaction) is generally very good. Litigation is almost non-existent. With the socialized system like the Scandinavian, the whole profit-motive is being removed from the patient-doctor relationship which is very healthy and reduces overtreatment and overdiagnosing (unnecessary tests, scans and biopsies). From my scanty knowledge of the health system in NS Germany the situation then and there was similar to the current Scandinavian one. However, in today’s America, where the Government is in the hands of an enemy who uses the Talmud for their guiding principles, I think ObamaCare will become a tragedy for the society. We can’t be bothered by the Jews in power. We must scurry around looking for all those Muslims throwing rocks at Christians. Never mind that the damned Jews are throwing lead at them. (Sarcasm off). So Alex picked the winners of his video reporter contest. He chose a young beautiful blonde who looks completely naive. Perfect fresh meat for Alex the Zionist. Alex chose a Black male video reporter whose video dissed Whites. His video was the worst of the bunch but Alex picked him with a big smirk. No surprise on that one. Alex has always had a thing for Black males. The only defence that Gentiles have against the Jews and their master Lucifer is to turn to the Savior Jesus Christ, the Son of God. Anything else is useless. Look what happened to Germany when Hitler rose to power promising to save Germany from the Jews, he was a kind of false Messiah for the German people who promised a “thousand year reich.” Well Germany was crushed and the German people who put their faith in Hitler were crushed. The only on who can save us from the Jews, or rather from Satan and his Synagogue, is God. False gods and ancient mythologies have no power against the devil and his chosen people, in fact idol worship is the very reason why God has probably allowed the West to fall into the hands of the Jewish scourge. But we have the prophecies of Jesus and St. John which say that all the world will be subject to the Antichrist, and only those Christians who refuse the mark of the beast, refuse to worship the Antichrist, and who overcome by the blood of the lamb and the word of their testimony shall be saved (Rev 12:11). Away with idolatry and dead pagan gods, only Christ and Him alone can save us. The US, unfortunately, is heading in the opposite direction of Russia; in that, Christianity is in revival as a result of moral leadership, while the now USSA, Christianity is under growing attack by the current Marxist leadership and its Talmudic handlers. Therefore, the choices before this country are confronting the Satanists as Russia did, or continuing to follow them and perish. That is quite a decision. This is something the great Arnie Gundersen has been warning for a long time. The pool of spent fuel rods has fallen down into the reactor. Consequences are grave, to put it mildly. Hi everybody. I am from Sweden and in my experience our socialistic healthcare works well and it cost us about 5% av GDP. We pay a small fee of USD10-20 per visit. Was down in Cadiz (very south) of Spain and broke my hand and hip in an accident, ambulance, two operations and 10 days in hospital and it cost me nothing. The Cadiz Hospital send the bill to Sweden and our central hospital bureaucracy for payment, I just showed them my “Blue EU-Card,” at least one good feature with EU, simple coordination between countries. Socialistic healthcare is an area were taxpayer subsidies do not lead to overuse, who wants to go to the doctor just because it is free? Well, I know many Americans do not want government healthcare and I respect that and I have no idea how Obamacare works, but hopefully it want be the end of the world for you. The world needs happy Americans to inspire us all. You people take care and fight Jewish infiltration and injustice and take America back, it is yours. Very nice new video blog by the way. The USA will never be like Sweden. First Sweden is mostly healthy White people. Second the standard of living is sky high in Sweden. Third Swedish women are for the most part pretty and friendly. Swedes need suckers for their banks which is why they do not want the USA to fail. Swedes would be wise to look to Russia and Eastern Europe for real economic growth. Russia will be the last superpower standing but it will also go to the sadists after Russia buys cheap products from China. The USA is finished. Swedes are naive to think otherwise. When the White population goes the human race ends. RT is Zionist news which is why they let Alex Jones and Max Kaiser on it. Pravda is a good Russian online news source: english.pravda.ru and so is theghostnation.com website. Swedes are matched best with Ukraine culturally. The USA is the last country any beautiful country (Sweden) should look to for anything good. I just had to remark on how absolutely repulsive Kagan is in both countenance and manner. I cannot imagine how anyone, even ones equally repulsive, could avoid cringing upon her arrival into a room. She makes me cringe just from video and photographs, even her words are nauseating. Dearest Brother I just wanted to say how much I depend on your dedication and fortitude as a source of inspiration and hope. I pray daily that more like-hearted persons will discover your site and join you in faithful support of this most necessary cause. I also wanted to thank all of the individuals that have taken to posting comments as of late, truly the atmosphere of dialogue is both thought-provoking and refreshing. The funny thing is, I have Jewish colleagues who loathe Kagan and Obamacare. God forbid they should connect the dots! As far as I am concerned, no “off topic” apologies are necessary when it comes to what is happening at Fukushima. I’ve been following the updates since it happened. For those of you who live on the West Coast of the USA, you need to realize that Japan is STILL dumping 1000 tons of nuclear waste into the Pacific ocean every single day and all that radiation is going to eventually arrive on the West Coast along with all the garbage from the tsunami, which is already showing up along the coastline. For those of you think it doesn’t affect you, think twice before you open up your next can of tuna fish. Blue Fin Tuna is now showing a 10% rise in radiation levels! Presumably all other fish, shellfish, kelp and algae products harvested from the Pacific are showing a similar rise in radiation. Japan’s leaders have evidently been quietly contacting the leaders of other nations pointing out that Tokyo may ultimately have to be evacuated and are asking if, in the event that they must evacuate Tokyo, would said country be willing to take in Japan’s nuclear refugees. The ongoing story is indeed HUGE in spite of the fact that there has been a mainstream news cover-up since day 1 of the disaster. Those Mammon-worshipping Jews running the Nuclear Regulatory Commission don’t wish to “alarm” the public for fear that people will call for a shut-down of the nuclear reactors operating in the USA. So what if even moderate earthquakes can cause reactor melt-downs? Nuclear reactors are nothing but money machines for the filthy rich who make a fortune from them. Do you think its safe to buy anything from Japan — food or supplements wise even though if its far from the place where the initial impact occurred? Writing fom the central Midwest, I’m extremely concerned about the drought situation on our food supply. In all of my 50 years living here, I have never seen it so dry in June. We have the whole summer yet to go. The drought is not centered only in one region, but covers the majority of the U.S. mainland. Even if rains come now, it may be to late for the crops to produce a good yeild. If the store food shelves go empty the social upheaval in this country will far out way and negate anything that Obama care could do. If you turn away from the Lord he very often hits you at the dinner plate first. Re: Russia and the abortion rate. Reducing the abortion rate in any country requires economic incentives for women to keep their pregnancies, meaning health insurance that addresses prenatal and maternal care, high employment rate with flexible maternity benefits, a stable social/family structure. The Orthodox and Catholic Churches should work for a climate that recognizes these realities. In Britain the NHS is a worthless, garbage communist healthcare system that is used to enslave the people of Britain with debt. Patients are treated like stupid children with almost no say in how they are treated or the care they receive. I suspect there are a lot of Freemasons who are skimming off large profits. The Doctors are lazy, complacent, slothful creatures who never seem to be in a hurry receiving massive salaries for forcing the worthless expensive drugs that the NHS is forced to buy from the Zionist drug companies. Detailed records are kept of all “patients” which the Anglo-Zionist police state can access at any time they want. Let us not forget the mental health act and the section 136 which allows the Zionist/Freemason police to take any person to a mental prison if they try to report crimes done by Jews and Freemasons. If I hand one pound for every person who was jailed under section 136 of the Mental Health Act for trying to report crimes by MI5/MI6, the Zionist’s secret police, lets just say that BN would have no financial worries ever again.